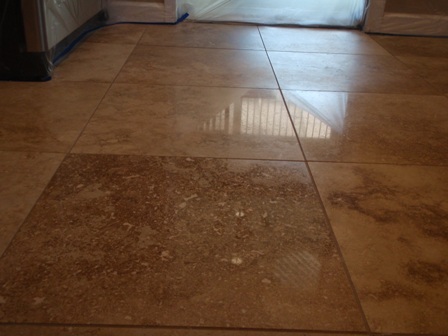 Travertine polishing is a very important step in the travertine stone restoration process. Just polishing travertine without honing, will not remove unwanted etch marks or accumulation of scratches. 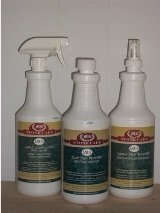 Honing the travertine is always recommended before polishing. 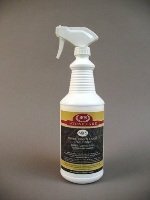 Honing is the complex process of restoring marble or travertine floors or other surfaces with the use of diamond encrusted pads to scratch, or hone the marble surface. Honing travertine first starts with a course grit diamond pad, removing a layer of travertine and continuing on to finer grit diamond pads to attain the desired polished finish. The last few honing steps are actually mechanically polishing the travertine. Once the travertine surface begins to have some reflective properties, the last step is to polish the travertine with polishing powders. An etch mark occurs when an acidic liquid comes in contact with a travertine surface reacting with the calcium in the tavertine. In general, mopping your travertine floors regularly with a neutral floor cleaner and a flat mop, will be the best and easiest way to maintain your travertine. 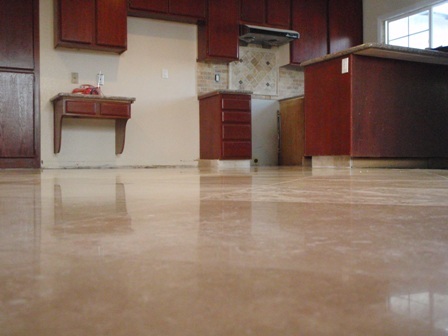 If you have polished travertine floors in your home or place of business, eventually they will need to be polished. However, if it's been a while since they were installed, it's most likely they will need to be honed first, before travertine polishing can begin. Polishing travertine floors or marble stone restoration is a multi-step process and sometimes can take more than a day to do if the floor is quite large. Because honing travertine floors is a done using water, there is no dust associated with the process. After each honing step and the travertine polishing step, all the excess water is vacuumed up. 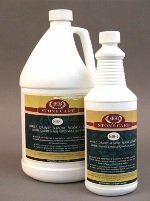 When it comes to travertine polishing or just maintaining natural stone and tile and grout, we strive to help educate our customers on the best protection they can have, helping them save time and money in costly restoration costs down the road.